Graham edwards offers a selection of standard and bespoke livestock trailers from 750Kg gross (for car and light van towing) up to 3500Kg gross ( for 4x4 vehicle towing) and from 8 tonnes to 16 tonnes gross for tractor drawn rigs. We feature unique deck designs in both our 3500 Kg trailers and our tractor drawn containers. 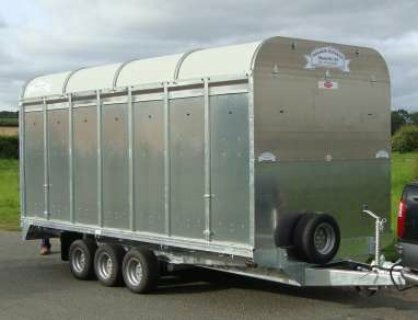 These livestock trailers are available from your authorised Graham Edwards distributor Toller Trailers located in Dorset. Call us on 01300 320476 and we will be pleased to assist you with further information on the whole Graham Edwards range of trailers.